What difference does culture make? 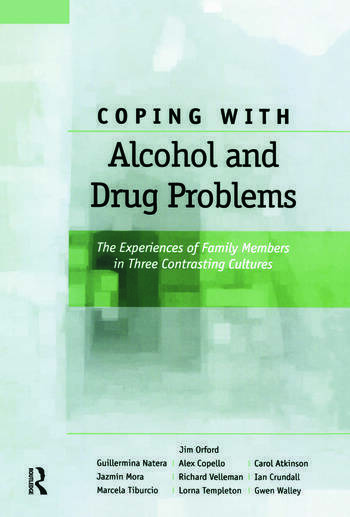 Coping with Alcohol and Drug Problems: The Experiences of Family Members in Three Contrasting Cultures aims to deepen and extend understanding of the experiences of family members trying to cope with the excessive drinking or drug taking of a relative. models of understanding: how families continue to be pathologised and misunderstood. an integrated view of alcohol and drug problems in the family. ways of empowering family members. This book aims to demonstrate the possibility of a constructive alliance between professionals, substance misusing relatives, and the affected family members by thoroughly investigating the dilemmas that face family members and the lack of support they experience. This fascinating insight into the impact of alcohol and drug problems on family members will be a valuable resource for all those who are interested in substance misuse in family and cultural contexts, and particularly those who are interested in the treatment of alcohol and other drug problems. Models of Understanding: How Families Continue to be Pathologised and Misunderstood. Coping with Alcohol and Drug Problems in the Family: A Review of Previous Qualitative Research. The Three Study Locations: Mexico City, South-West England and Indigenous Northern Territory, Australia. A Description of the Study in Three Socio-cultural Groups. The Impact of Excessive Drinking and Drug Taking on Family Members. How Family Members Cope. The Support Family Members Get from Other People. Variations on a Theme: What Difference Does Culture Make? An Integrated View of Alcohol and Drug Problems in the Family. Ways of Empowering Family Members. The authors are an international collaborating group from the following three centres: the Epidemiological and Psychosocial Research Directorate at the National Institute of Psychiatry, Ramón de la Fuente, Mexico City; members of the Alcohol, Drugs and the Family Research Group in England, based at the Universities of Birmingham and Bath and their associated National Health Service Mental Health Trusts; the Aboriginal Living with Alcohol Program of Territory Health Services, Northern Territory, Australia.